Microsoft released the second cumulative update for Windows 10 version 1803, and it comes after the the release of similar updates for previous versions (1709, 1703 and 1607) of the Windows 10 operating system. It comes as no surprise, therefore, that the new cumulative update for the most recent version of Windows 10 shares several changes with cumulative updates released in the past days for older versions of Windows 10. Still, the changelog is a lot shorter and the majority of issues in Windows 10 version 1803 are not addressed by it, unfortunately. On a personal note: the update did not fix that Edge or Windows Defender won’t start at all on one of my Windows 10 devices. Updated Time Zone information issue fixed. Addressed a reliability issue that would cause Microsoft Edge and other applications to stop responding. Addressed a Windows Hello enrollment issue on systems with dGPUs. Fixed a power regression issue on systems with NBMe devices. Fixed an issue that caused closed-caption settings to be preserved after upgrades. Addressed a web worker issue in Internet Explorer. Those are all the changes that Microsoft lists in the changelog. It is possible that the update includes other changes as Microsoft lists “key changes” only in release notes. Microsoft lists two known issues on the page and notes that they have been resolved with this update. 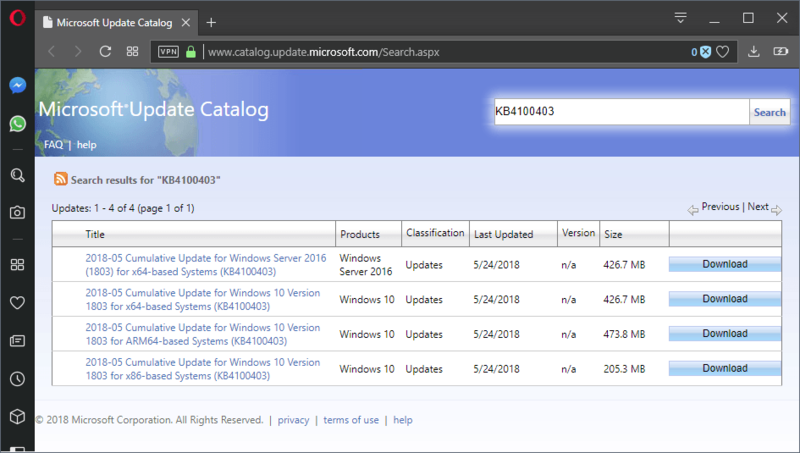 While KB4100403 fixes issues with certain Intel and Toshiba SSDs, Microsoft recommends that users wait for the June 2018 Patch Tuesday update before the upgrade to Windows 10 version 1803 is made. Microsoft notes on the support article that the update is available through Windows Update and the Microsoft Update Catalog website. A quick check on Windows Update did not return the update at the time of writing though. You can download the standalone update from the Microsoft Update Catalog website and install it manually on devices running Windows 10 version 1803. As always: unless you experience any of the issues fixed in the update, you may want to wait with the installation of cumulative updates as Microsoft’s recent updates track record is not the best. Create a system backup if you don’t want to wait with the installation.